If you’re trying to grab a shelter ideal for multiple cats – whether they’re your own outdoor kitties, strays you’re trying to gain the trust of outside, or feral cats you’re trying to keep warm and safe from bad weather conditions – in my opinion, the top feature a multi-cat outdoor shelter can have is not a large size, but a dual-door design. Why? 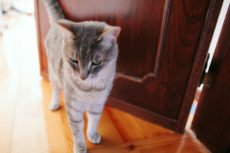 If cats ever get into squabbles between themselves, the second of the two doors can be used by a cornered cat as an escape route, which could prove a damage-reducing or even life-saving measure in instances where aggression escalates to violence. 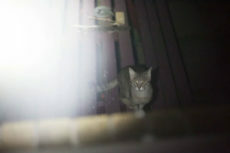 The second door could also come in handy if another animal were to try to attack a cat holed up in the pet house – raccoons, foxes, wolves, to name a few. But you would know whether or not other animals are typically aggressive toward cats in your area, and we’re definitely off topic, so let’s get back to the point of the discussion – multiple cats using one outdoor shelter. If the multiple cats you’re trying to house are unfamiliar with each other, belong to different families, or even are yours but do get into squabbles that get a little physical every once in a while, I’d say it’s best to opt for one of the two-door/extra back door exit models of cat shelters I’ll be featuring in this list. 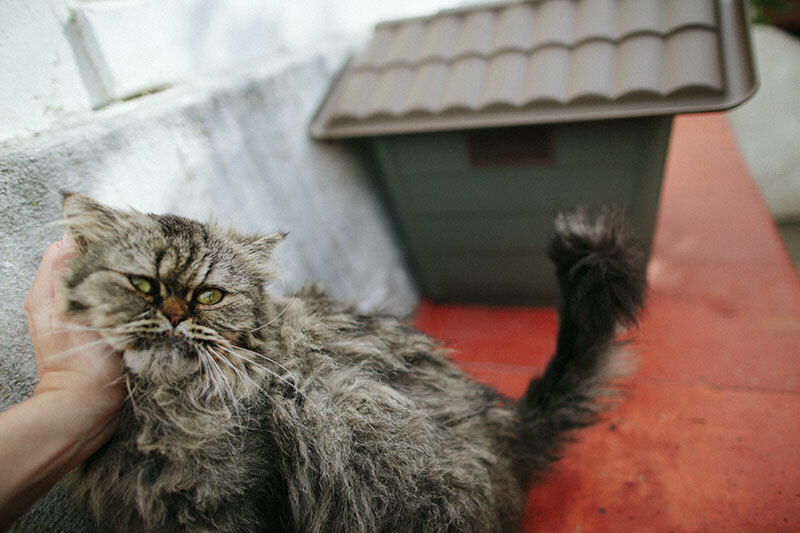 Cats in houses with second doors will never find themselves cornered by other cats without a means of escape – a horrifying thought if one cat gets aggressive for even a moment. Of course, there are plenty of instances where escape doors are unnecessary. If you have more than one outdoor cat to shelter, and you know for a fact your cats get along well and that no other animals are likely to come by, two door integration isn’t a necessary feature. The same would be true of a pet shelter for small family of feral cats you’ve seen hanging around your garden, especially if this family is made up of a single mamma cat with a few of her kittens, who are unlikely to get aggressive with each other to the point of violence. 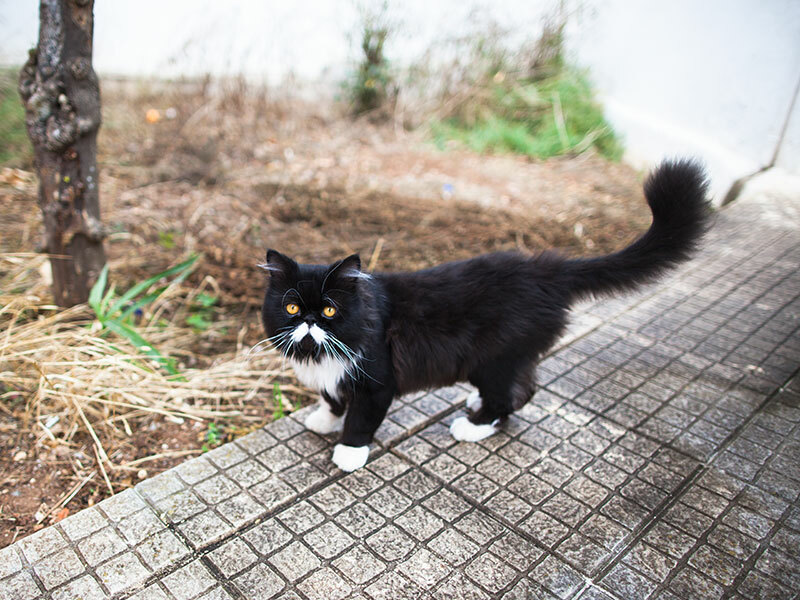 In these situations, I’d recommend widening your search to include all the outdoor cat housing options available, to be sure you’re getting exactly what you want and need. Looking in particular for a warm winter shelter because you live in a cool or even cold region? I’d recommend narrowing your search to all insulated cat houses and/or electronically heated cat shelters, rather than necessarily looking for a large, extra-large, double door, or marketed as “made for multiple cats” option. Which brings me to why I don’t really count size as the most important factor to determine whether a pet shelter will be a good multi-cat house to use outdoors: while most outdoor cat shelters are technically intended for one cat, many pet owners leave reviews on those same “single” sized pet houses reporting two or even three cats being capable of using these shelters at once. If you have a small number of felines to house, I’d say easily up to three, and they are the type to be happy to snuggle up together for warmth, it makes no sense to overlook a single sized cat housing option for them. 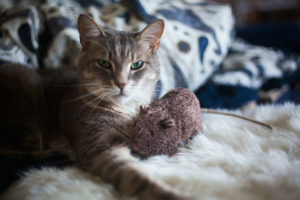 If you’re sheltering a larger number of cats, you want the cats you’re sheltering to have more space, and/or you want to place things like pillows, blankets, and other snug objects in the house to keep things extra cuddly (word to the wise – keep an eye on these if you do place them, as you don’t want them to get wet in rain or snow; cats can get hypothermia, too! 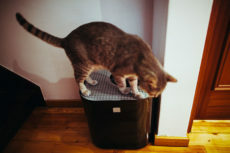 ), you may want to go bigger, but you also have the option of grabbing two small cat houses instead of one large one. Two small houses you can also place in different spots in your garden, which could be nice for multiple cats to enjoy. Cats certainly do love being given plenty of snuggle space options! Let me know your thoughts about outdoor cat shelters for multiple cats in the comments. Ever had one? Did you buy it or DIY it? Do you think the two-door feature is important in your case? If you had to house multiple cats outdoors, do you think it’s best to grab multiple smaller homes or one big cat house? Now let’s get into the meat of this article – what I think are some of the best heated, insulated, or just bare bones water resistant outdoor cat shelters for multiple cats. 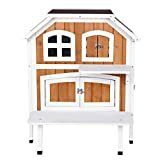 If a durable, gorgeous, bare-bones wooden outdoor cat house is what you’re looking for, this Petsfit 2-Storey model is a phenomenal option. Not only does it have two doors, but also consists of two levels, so multiple cats can easily share the same space – and share collective body heat – without getting in each other’s way too much. 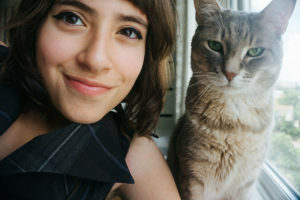 One cat sick of being near another? It’s easy to hop to another level, staying warm, but getting distance as well. One pet parent says she has hers under a carport to keep things completely dry. You should be able to add a heating pad or extra insulation to this cute outdoor tree house quite easily as well. Blankets, pillows, and even self-warming cat beds can all be slotted in and out to make the space more comfy and keep it interesting. Have a peek at how the interior looks with a small pillow inside. This is probably one of the best electronically heated outdoor cat houses currently available. It’s insulated, has two doors, a heated pet mat with a chew proof cord, a plug in timer, see-thru plastic doors… I don’t think I can even conceptualize a feature for a heated outdoor cat shelter that isn’t already integrated in this particular house. Is it perfect? Definitely not, no product is. I’ve seen a couple of people complain about the size, while a couple others say their cats won’t use it. But in terms of sheer volume of positive reviews to negative reviews, I don’t think you’ll manage to find an overall more well loved outdoor heated cat house right now, and while it’s not intended to be used for multiple cats, it does look to me like there’s probably just enough room for two cats who like to snuggle inside. 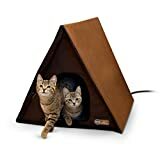 If you have more than two, or your cats aren’t the biggest fan of being squished up together, or if you’re trying to shelter multiple strays from different families outdoors, I think buying two of these heated cat houses like this reviewer did is likely more helpful than buying one large model. Other options if you’re looking for single-size heated outdoor cat shelters with an escape door include: K&H Pet Products’ Outdoor Kitty House Heated Cat Shelter & PawHut’s Small Indoor Outdoor Portable Water Resistant Heated Cat House. Prefer having extra space for an extra couple cats on a heated outdoor cat house since you have multiple outside kitties who love to snuggle up? 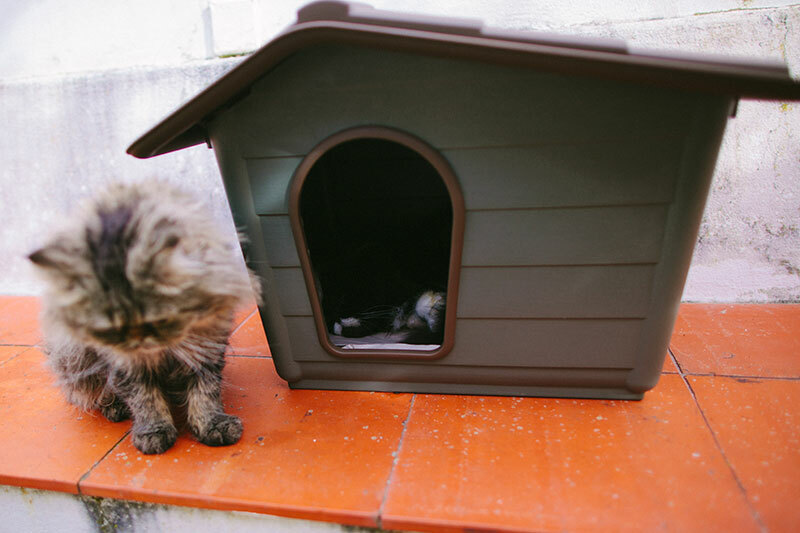 This K&H Double Cat House is probably your best bet. 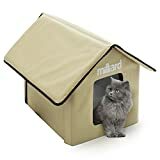 It’s not as well loved as the smaller alternatives, but it does the trick for cheaper than you can buy two of the small shelters, and kitties really seem to dig sitting on the roof of this thing, so felines typically get a two-in-one nap spot, one inside and one out. Many reviewers state this product isn’t as waterproof as they’d like, so I’d be sure to try placing it in a spot that gets very little precipitation – like in a gazebo or under a deck. In case you’d prefer this model without the electronic heat mat, K&H does make it that way as well. Looking for a cheaper multi-cat outdoor shelter that’s comparable to this one? 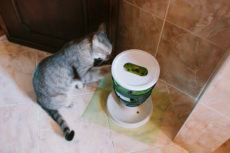 Try the PawHut Small Indoor Outdoor Portable Water Resistant Heated Cat House. 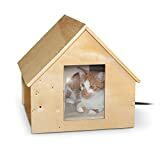 As mentioned in the intro, one reviewer stated (s)he picked this particular outdoor heated pet house up for a small family of three feral cats living in his/her backyard. It looks to be the perfect size for that small family based on the pictures taken, has two double doors, and the newer model features see through plastic door flaps for easy access without heat loss. Dig the A-frame design? Want something cute and trendy like this, but made of wood and don’t necessarily need a heater pad integrated? 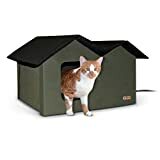 Petsfit’s Triangle Wooden Cat House with Back Escape Door fits that description to a T, though it does look smaller than K&H’s A-frame, so keep that in mind. 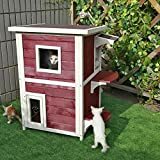 If you love the idea of a multi-level cat home, but have plenty of cats to keep sheltered outdoors, you may want to opt for this three-level wooden outdoor pet house by Trixie. It looks phenomenal (so good, I’d strongly considering even having one inside), it’s layout is well planned, and it’s got ridiculously small footprint considering how many cats can cozy up inside. I can’t imagine a better multiple cat home for small gardens or tiny outdoor courtyards. 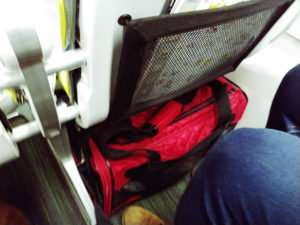 Take a peek at how it looks like with two cats inside, and how the interior looks. I don’t think it’s as big as you may imagine first looking at the listing. Still, it looks ridiculously comfy for, I’d say, up to 3 or 4 cats at a time – even up to 6 I would imagine – depending on their size and how much they like to snuggle together. Yet another single-cat house that I believe at least two cats can easily snuggle up in together. Made of wood, this heated outdoor cat shelter is really well loved by pet owners, and certainly by cats themselves as well. I definitely think a cat house made of wood is much easier to build upon as well, in case you’d like to further insulate the cat house for really cold weather. Not only does this Petsfit 2-Story cat shelter have a cozy looking two-door cat house integrated into the bottom portion, it has a top area covered by a roof to keep cats dry if it rains or snows, where a couple cats could easily lounge, spending house snoozing yet also being able to keep an eye on the goings-on around a garden. 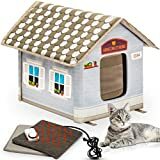 This particular version comes with adorable stairs at the front, though if you’d rather, Petsfit makes the exact same model with a scratch pad instead. 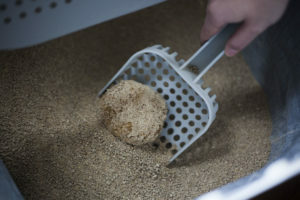 Definitely think it’s impossible for cats to love either way you grab it, though I can certainly see the scratch pad version helping to keep your outdoor patio furniture, welcome mats, trees, or even your wooden patio itself safer from all the scratching that goes on outside. 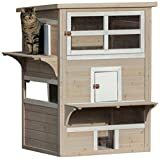 I think this Trixie two-storey cat house is ridiculously gorgeous, and to me looks more like a dollhouse than any other I’ve seen. It’s got ample room on both levels, plenty of space for pillows, blankets, and the like. One reviewer made a cute little set up for her cat on the first level – including a feeding station and blankets. I actually really want this one now – to place indoors for my two cuddlies! Yet another crazy multi-level cat condo that would be perfect to use for multiple cats outdoors. I do believe this is the largest outdoor cat house I’ve featured on this list, and that it looks amazing and almost like it’s an apartment made for cats. Certainly not the cheapest, but I think it may be the best option if you want a single cat house for as many cats to fit into as possible. 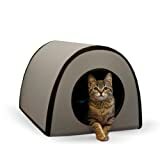 One of the most popular insulated cat houses out there, based on what I’ve seen. I don’t think a large number of cats could fit into this one, but I definitely think two could easily fit snuggled up together, maybe three depending on their size and how content they are with overlapping and squishing together. One alternative in case this is the type of thing you’re looking for: Pet Peppy’s Outdoor/Indoor Cat House. 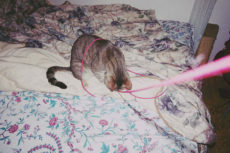 A single-level option from Petsfit that I think multiple cats would absolutely be happy to use together. It seems a lot of people are using this one to shelter stray and feral cats in their neighbourhood with an enormous amount of success. One reviewer left tips for making the box warmer and more weatherproof – so check those out if you’re DIY savvy! This is definitely not a large cat house, so if you’re trying to get more than one cat in at once, and your cats are large, this is definitely not the option to pick. 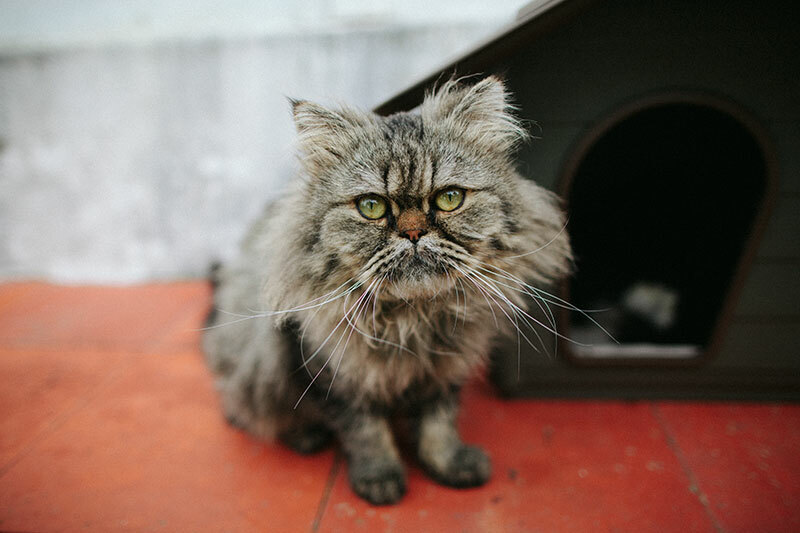 However, if your cats like to snuggle up, or if you have multiple cats, some who don’t get along all that well, and you’re trying to shelter at least one at a time but leave an escape route option, this heated outdoor cat house should be perfect. Had to note – one reviewer left some pictures of how she hid two of these in a waterproof bench, and added extra insulation – you have to check it out. It looks so good, the cats must be ridiculously happy, it’s so sleek, discreet, like a hidden cat litter box. I’m obsessed. Would definitely try something like this (or rather, make my hubby upgrade a bench for me like that) if I had outdoor cats back when we lived in Canada. 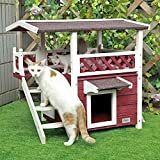 Same story as before – a perfect cat house if you’re trying to house one kitty at a time, maybe two tops, but really need that second door feature considering the cats you’re sheltering don’t get along and may need access to an escape route. Not a cheap option, but really well loved by pet owners because of how crazy modern, sleek, and gorgeous it looks, and also because it’s durable and high quality compared to the average outdoor cat shelter. Really like this one and would love to read through some tips on how to make it work best for you? Check out the advice left by this thorough reviewer. 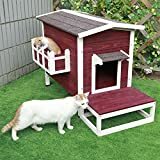 Your Tips on Outdoor Shelters for Multiple Cats? Now it’s your turn. What are your thoughts in relation to shelters to house multiple cats outdoors? Have you ever done this yourself? 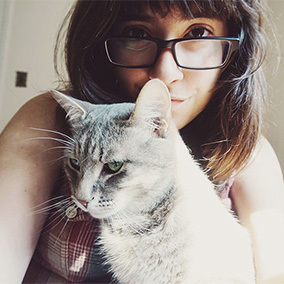 How many cats did you have to shelter and what type of set up (small big/number of cat houses/types of cat houses) did you end up with? Would you have done anything differently with the knowledge and experience you have now? Literally any thoughts, tips, advice you have related to this topic – please leave in the comments down below! 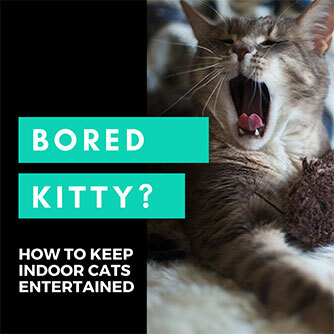 You could be helping quite a lot of other pet parents out. Happy Valentine’s Day, to all at KittyClysm! Our Cat Hotel only has one exit/entrance per floor, because having two means wind can blow through. We added windbreaks in front of both entrances, because neither cat would tolerate flaps (yes, I tried! ), and I didn’t want snow/rain to get inside, if possible. Thank you so much! 🙂 Hope you guys had a happy Valentines Day, too! 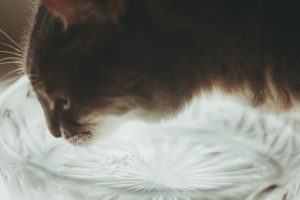 That’s so strange that the cats won’t tolerate flaps! Wonder why that is.